U.S. natural gas supply report. In the first half of 2018, U.S. natural gas supply and demand grew significantly compared to the first half of 2017. According to EIA’s Natural Gas Monthly, natural gas consumption and exports averaged 93.4 billion cubic feet per day (Bcf/d) during the first half of 2018, or 12% greater than during the first half of 2017. 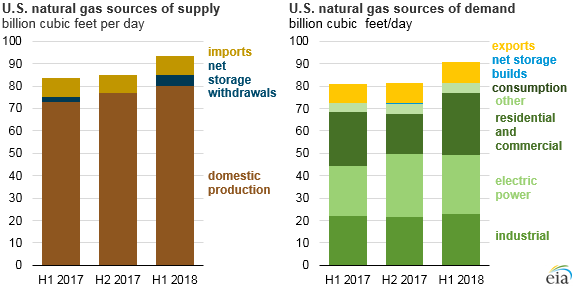 Total supply of U.S. natural gas, including domestic production, imports, and storage withdrawals, averaged 93.3 Bcf/d during the first half of 2018, a 12% increase from the first half of 2017. The increase in U.S. natural gas supply was driven by production, especially from the Appalachia region. Total U.S. dry natural gas production rose 7.4 Bcf/d (10%) compared to the same period last year. The additional pipeline capacity brought into service since June 2017 has enabled production increases, including the Leach XPress, the Rover Pipeline, and Phase 1 of Atlantic Sunrise, all of which transport natural gas out of the Northeast region. Domestic natural gas consumption in the first half of 2018 increased in all sectors compared with year-ago levels. The largest growth occurred in the residential and commercial sectors, which increased by 3.8 Bcf/d (16%) combined, compared to the first half of 2017. Residential and commercial consumption is primarily related to heating needs, and the beginning of 2018 experienced record, prolonged cold temperatures across many of the Lower 48 states. Population-weighted heating degree days, a temperature-based proxy for heating demand, were 17% higher in the United States during the first half of 2018 than in the first half of 2017. In the U.S. electric power sector, power plants used 3.6 Bcf/d (16%) more natural gas during the first half of 2018 compared with the same time last year. Electricity demand tends to increase as hot weather increases demand for air conditioning or as cold weather increases demand for electric space heating. Natural gas consumption in the power sector has also increased with the increased buildout of natural gas-fired power plants in much of the country. Industrial consumption of natural gas in the United States (including lease and plant fuel) was 1.6 Bcf/d (6%) higher in the first half of 2018 compared to the first half of 2017. Industrial consumption of natural gas is affected by weather-related space heating needs, particularly in the Northeast and Midwest. In addition, industrial consumption is a function of industry-specific demand and market factors. For example, natural gas used in petroleum refining will vary with refinery throughput while natural gas consumed by the fertilizer industry will reflect the needs of the fertilizer market. Gross U.S. exports of natural gas have also increased from year-ago levels. Liquefied natural gas (LNG) exports, which mostly go to countries in Asia, and pipeline exports, which go to Mexico and Canada, collectively increased by an average of 0.7 Bcf/d (8%) from the first half of 2017 to the first half of 2018. LNG exports increased after Train 4 at the Sabine Pass LNG export facility was completed in October 2017 and Cove Point LNG export terminal began operations in March 2018. Overall, consumption and exports increased 2.7 Bcf/d more than production and imports in the first half of the year, which prompted withdrawals of natural gas from storage facilities. Relatively high net withdrawals and low net injections so far in 2018 have resulted in natural gas inventories falling 18% lower than the previous five-year average as of September 21, 2018.